This is pivotal to a successful relationship. Even in marriage, couples can hurt each other so badly they would start considering divorce. Hurts from the treatment you got from you Ex needs healing before proceeding to another relationship, or else that new person will suffer in your hands as a result of the hurts. How do you get healed of hurts? How do you forgive somebody that cheated you and manipulated you and you are so hurt that you could shoot such a person? Yes, everywhere your soul has been punctured and ruptured, every area where your emotions were trampled, sampled and wrecked, God can and will restore! God will reset your soul to factory default, if you allow Him! He will give you the grace to heal from wounds, forgive those who hurt you so that you can move on with your life. If you are going to hear God speak to you, if you are going to hear His voice always, if you are going to be led by the Spirit of God, you have to do away with habitual sins. Sin shall not have dominion over you; that is what the scripture says. So, really, you discover that there is no excuse. Don’t let the devil push you to that familiar corner where he tells you that you are too far gone or that God hates you! God doesn’t hate you! How would you send your son to die for somebody you hate? You see, God dislikes the sin, but he loves the sinner. So, he made a provision for you and invited you to have a relationship with Him through His son. When you do that, He also goes ahead to give you His Spirit, Holy Spirit to help you live above sin and compromise. When you clean up your life, you will hear Him more! It's 2 days to KHC Camp-Meeting! Heaven is about to kiss the earth! Yokes broken, burdens lifted! Freed! 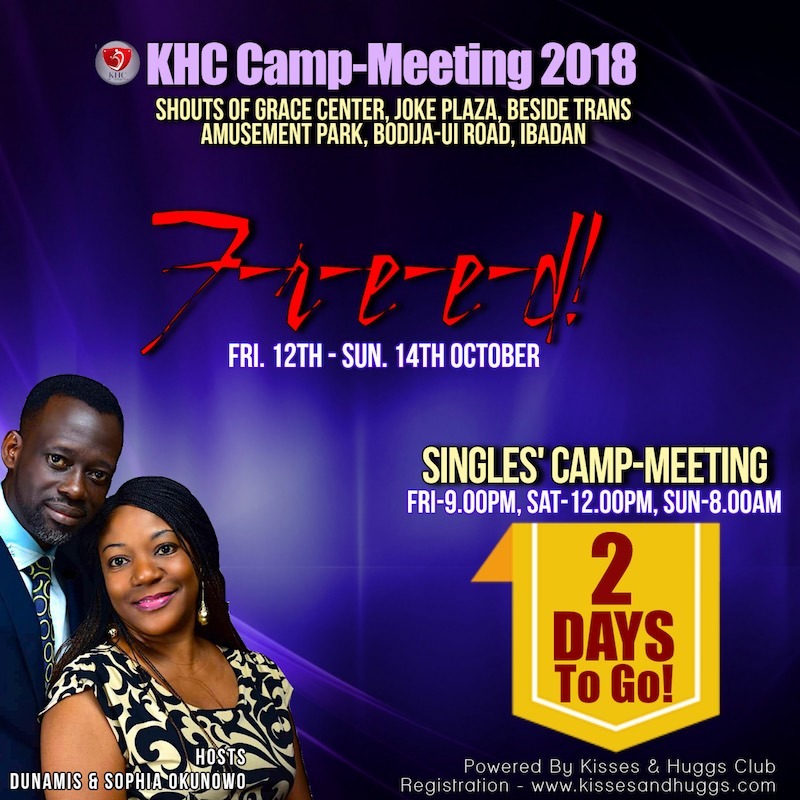 12th - 14th October are days you cannot miss as God visits you like never before in the area of relationships @ KHC Camp-Meeting 2018! We will be starting 9.00pm on Friday with a Vigil! The theme for this year is FREED! You will be free indeed! Ensure you use links below to reserve your seat and also to check sessions, schedule and accommodation provisions. I have direction from God, I am not confused.